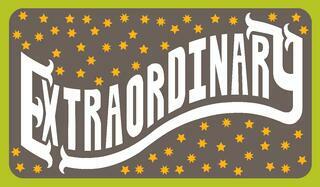 Once again, PCA&D is participating in the ExtraGive! Donate to PCA&D here on Friday November 17! 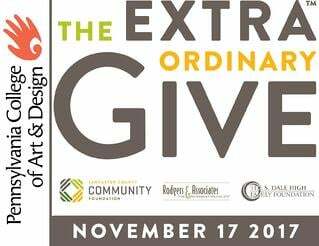 The countdown to the 2017 Extraordinary Give - Lancaster County's largest day of giving - is on! And you can help by supporting Pensylvania College of Art & Design. Coffee At PCA&D 8 - 10 a.m.
Start ExtraGive day off right with a cup of coffee, donated by Prince Street Cafe, and giving stations at PCA&D. Enjoy coffee donated by while you support prizes, including a massage from Dorreen Jamison, artwork and other prizes. More info. Join PCA&D at the Giving Party hosted by Benchmark! PCA&D will be participating in the Giving Party hosted by Benchmark at the Ware Center! PCA&D's Pop Up Print Shop will be there, once again run by Becky Blosser, PCA&D faculty member. Make a donation and receive a 3rd annual PCA&D-ExtraGive limited edition silkscreen design created by Austin Lord, PCA&D illustration Senior (Above - Extraordinary, a small segment of the poster Austin has designed for the occasion). Bring a T-shirt and we’ll silk screen it for you. The event is free and open to the everyone, and you can enjoy 20+ non-profits, including PCA&D, on display, live music, drinks and appetizers.